In the same way that I wanted Kim Yoo Jung doing dark angsty melodarama ( like 2015 Angry Mom) is the same as how I want Yoo Seung Ho to do more powerful angsty melodama (like 2015 Remember). These two terrific young actors will premiere dramas CWPFN (rom-com loves story ) last week of November while this "Revenge is Back" is first week December? Kang Bok-Soo is a now an adult, but his life has not gone smoothly. To get revenge on Son Soo-Jung and Oh Se-Ho, he returns to the same high school as a student. The environment at the school has changed and Kang Bok-Soo gets involved in unexpected cases. I agree this will good one if done right. Looks like it will touch the subject of bullying which is always sensitive topic. It's good to bring out awareness through dramas. As the title says "Revenge is back" It's going to touch of revenge, vindication and such after being falsely accused... I guess his life will be ruined because of the accusations. @Berou is the female lead confirmed? not familiar with her but I watched her in SUFBB. Jo Bo Ah is confirmed to star in SBS’s upcoming romantic comedy drama with Yoo Seung Ho. “Revenge Is Back” (working title) tells the story of Kang Bok Soo (played by Yoo Seung Ho), a student who is expelled from school after being falsely accused of being a bully. He returns to school as an adult to seek revenge, but he is unexpectedly swept up in a series of new incidents. Son Soo Jung (played by Jo Bo Ah) is the lovely and smart class president. She was Bok Soo’s first love, but she betrays him and returns to school as a teacher. Jo Bo Ah was praised for her acting in her latest work, “Goodbye to Goodbye.” She played the role of Jung Hyo, a university student who unexpectedly becomes a single mother. She was also recognized for her sympathetic personality that reached out to chefs who own small restaurants in SBS’s variety show “Baek Jong Won’s Alley Restaurant.” She is acknowledged in both dramas and variety shows for her charms. Jo Bo-Ah is cast for the lead female role in SBS drama series “Bok-Soo’s Back” co-starring Yoo Seung-Ho. For the drama series, Jo Bo-Ah will play Son Soo-Jung. Back in her high school days, she was the first love of Kang Bok-Soo (Yoo Seung-Ho). She betrayed him though and got him kicked out of school. She now works as a high school teacher there and meets Kang Bok-Soo again. “Bok-Soo’s Back” first airs December, 2018 (takes over SBS’ Monday and Tuesday 10PM time slot after “Where Stars Land“). 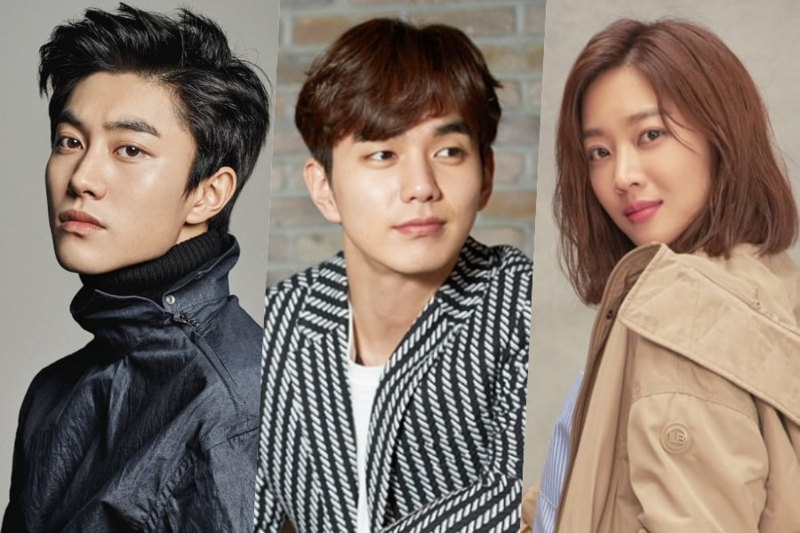 It's been confirmed that SBS's newest teacher romance drama 'Revenge Is Back' has cast its male and female leads - Yoo Seung Ho and Jo Bo Ah! The romantic comedy tells the story of a woman named Son Soo Jung, who never let go of the #1 spot in her academic career, but who suffered a few pitiful failures in her teacher certification exams - resorting to a career as a part-time teacher. She finds a job at her old school, where she meets her arch nemesis Kang Bok Soo (played by Yoo Seung Ho). 'Revenge Is Back' is set to air sometime in November, after 'Fox Bride Star'. Do you like the lead casting and the storyline so far? Hi ! My tagging worked !! I'm so happy to see you again. Will you participate in the discussion this time? Last time RL prevented you to do it. On a side note, YSH made a a cameo in the player drama due to his close relationship with Song Seung Heon and the production staff of the drama . Regarding the lastest casting news, I had no doubts JBA would accept it because it is a big opportunity, and I've read she has been playing the second lead characters for a while. I'm a bit disappointed though, I was secretely hoping the writer would be replaced LOL. We have to wait and pray the writing will be decent. I read one comment in dramabeans and nodded my head : this drama has certain vibes of the innocent man with the revenge part. And the innocent man is one of my all times favourite dramas , I became a huge fan of SJK because I got competely smitten by his portrayal of Kang Ma Ru. However in this case, there will be more fluff and the first love is the first female character. According to reports on October 5, actor Kwak Dong Yeon has chosen his next small-screen production after 'My ID Is Gangnam Beauty'. Insiders stated that Kwak Dong Yeon has been cast as a male lead in SBS's new Mon-Tues drama 'Revenge Is Back', as the role of Oh Se Ho. The character is a new chief director of a high school, a position he inherited due to his mother's divorce. If Kwak Dong Yeon's casting as Oh Se Ho is true, he'll be working with actor Yoo Seung Ho and actress Jo Bo Ah, who previously confirmed their appearances on 'Revenge Is Back'. The drama revolves around a woman who returns to her alma mater high school as a part-time teacher, and encounters her arch nemesis, another teacher at the school. Jo Hyun Sik's agency confirms him joining the drama. He will play the role of "Ma Young Jun". He was a victim of bullying as a student and becomes a teacher to help students who are suffering from the same problem, but instead, even as a teacher he is being bullied by students. The moment he gives up, he will change 180 degrees and show a different character. Kwak Dong Yeon has been confirmed for SBS’s upcoming drama! The young actor joins a cast including Yoo Seung Hoand Jo Bo Ah in the drama. “Revenge Is Back” tells the story of Kang Bok Soo (played by Yoo Seung Ho), who seeks revenge as an adult by returning to his childhood school, which he’d been expelled from after being falsely accused of bullying. Jo Bo Ah plays Son Soo Jung, Bok Soo’s first love who is now teaching at the school. An initial report about Kwak Dong Yeon’s casting prior to FNC’s confirmation described that he will be playing the role of Oh Se Ho, an always-smiling new chairman of the board at the high school, who has had a hard life. It states that his character will be part of a love triangle. Kwak Dong Yeon has previously appeared in dramas including “Moonlight Drawn by Clouds,” “Fight My Way,” “Into the World Again,” “Radio Romance,” and more. @sakura2016 became the victim of my nagging and rants . I'm sorry to her. Everytime a casting news came out, I went to her for ranting, wondering why YSH was refusing to come back. Trust me. Even though it is a revenge drama with a highschool background, it is still light in terms of " YSH's dark and melo" dramas. The melos he did before were full of drama, anguish and tears. He cried or had an anguished expression in every scene. Bullying is a sensitive topic and viewers might feel uncomfortable watching characters getting bullied, but we don't know what the writer has in mind for the plot. Maybe the drama won't touch on the bullying issue. Thanks for tagging me @Berou. Count me in. Excited to watch this drama. I must agree to some of you who worries about the writer, same thought, there will be doubts with writer and director but one thing for sure its YSH Drama and I have no doubts about his capabilities and i trust he will do his best. hoping that this thread will grow and will share more about this drama. BTW, thus anyone knows when will be the script reading and presscon for this project? (my apologies for being advance). Im confused. The three main char dont seemed like a bad person. I think the accusations was caused by some kind of misunderstanding? Yoo Seung Ho in a vengeful character again? count me in! I was very excited when I first heard the news of his come back but when the news of the writer, director and actress came out my excitement took a dip ( mainly because I'm not familiar with any of them). With that being said I will still give this show a try because it has Yoo Seung Ho in it . Rom Com is really not my genre, I lhave always liked Yoo Seung Ho in dark multi layered roles , I wanted to see him in a similar role but with a happy ending this time around but well all wishes aren't granted in this life so. ..Anyways I'll watch anything for my fav oppa, really hope this show works out for him, his entry into the hallyu list has been long over due. Hwaiting Oppa!! Kwak Dong-yeon (My ID is Gangnam Beauty, Reunited Worlds) has confirmed he will be joining Yoo Seung-ho (I’m Not a Robot) and Jo Boa (Temperature of Love) in the upcoming SBS rom-com Revenge Returns. I'm joining the party of yoo seung ho's come back! The idea of this drama as SBS's buffer for their 2019's big show(s) kinda bothered me. Although nothing is really sure for now. I agree that we have to see first the quality of its materials once they become available. 3 of 4 YSH's post military dramas are penned by rookies. Nothing against them really, some rookie writers have this refreshing way of weaving stories (amazing writers gotta start somewhere) however, I'm wishing that some big name in the industry offer him a script one of these near years. For now, I'm keeping my excitement for BSIB. Where the star's Land will end by Dec 4 that gives BSIB a Dec 10 suppposed premiere. With two months to air, they'll probably have their script reading by this week. I haven't watch Jo Bo Ah in any dramas, is this her first lead role?